It's almost the end of the school year and there's a lot going on. My daughter is graduating from high school on Wednesday and it also happens to be her birthday. With that conflict, we decided to celebrate her birthday today. Due to those plans, I had to get out early for my run. Even with that, I was pressed for time and decided to run laps at the high school. Last night, after I'd downloaded Friday's run from my Garmin, the watch froze and it wouldn't respond, no matter which buttons I pushed. I tried to shock it back by hooking it up to the USB and then the wall charger. Neither attempt worked, so I left it for the morning. I figured I could run with a stop watch if the Garmin failed to respond. 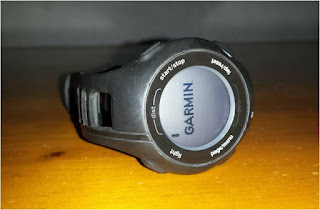 When I got up, the Garmin was still frozen and I began to entertain the idea of replacing my six year old FR210 with a newer model. Things are starting to break on it and I noticed one side of the wrist band is beginning to separate. Before giving up on it, I looked online and found a video that showed how to unfreeze my watch. It worked. The track was almost empty when I got there. Just me and a guy who spent a lot of time stretching while I circled the track. I was eventually joined by another runner who circled the track much faster than I did. I was prepared to count the number of times I got lapped but the guy quit after a couple of times around. The stretching guy eventually made his way onto the track. He was wearing one of those elevation training masks and started doing intervals. Or should I say, one interval. I ran four more laps before he did his next one. By then I was finished with my workout. We had a great birthday celebration and I managed to get in a lot of Fitbit steps throughout the day. Tomorrow is Father's Day and I'm going to try to get out early again to maximize celebration time. Thank you for posting the tracking of the track workout, otherwise I would have thought you were running in circles rather than ovals. That would have been devastating. Actually, they were ellipses. And you really should see someone about your irrational fear of running in circles. Hmm, apparently my posts need approval after 3pm. Sorry, I had the sarcasm filter set too high.